Police credit ‘Turko Files’ and tipsters for finding stolen memorial benches and the people who took them. EARLIER UPDATE: Channel 10 News just reported that the two benches were found in George Gonzalez’s junk yard in South Bay. Police acted on a tip, Sgt Paul Salas told the news. Gonzalez told reporters that he was hired by someone to remove the benches, someone who was supposedly tired of people hanging out on the benches at night, drinking and smoking. Police say whoever ordered the benches taken is looking at grand theft. After my first report aired , a Turko Files fan called to tell me they recognized the crane photographed illegally removing the benches. Acting on that information, and tips from construction industry insiders, early this morning I located the benches at a South San Diego junkyard and alerted SD Police. Full details- including a confrontation with the man who owns the crane—will air tonight on the Turko Files at 6pm on KUSI News. John Story just reported to us that both of the memorial benches – stolen on July 8th – have been found and both are in good shape. John said SDPD Lt Kim McElroy called him to inform him of this development. Lt McElroy declined to say anything else, except that the police investigation is continuing. This is certainly good news. We await further developments. We will inform our readers of any new information. John Story is the son of George Story, whose memorial bench was stolen along with the Cappelluchi family’s bench for their son. Does that mean leads provided to the police lead them to where the thief hid them? Does this mean they were voluntarily turned into the police? The benches were stolen and I hope the wrong doer will be prosecuted to the full extent of the law and be an example for others should they wish to follow suit! 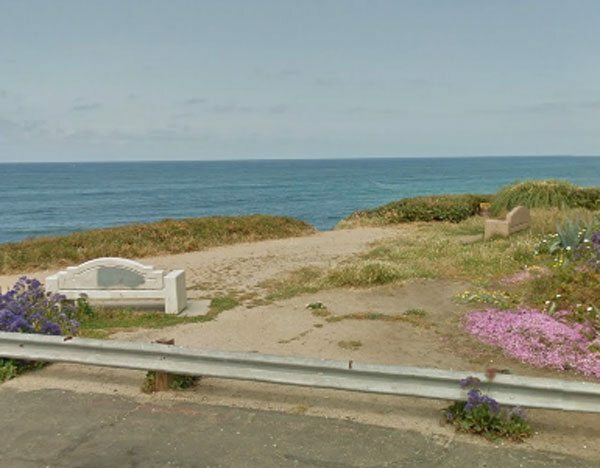 Good news for the bench donators and for those that like to enjoy the beautiful ocean, sky and stars at this spot. A BIG Boo to those people that bring their dogs to this area and let them crap and pee there. I was there last night and there is dog feces everywhere. Maybe dogs should be prohibited from this area to keep it cleaner? who had them removed went to the police and told them last week. Wish your BIG Boo would be enough to make the Streets Department start cleaning up that mess from those annoying people and their animals. I like the idea of a “no dogs allowed “sign there for starters. Dear Readers: please see the new update about the stolen benches. Apparently Mike Turko found them! Way to go….TURKO and OBRAG! I also love the fact that whomever was the perpetrator, wasted their money paying for the crane! Hold on you don’t know who took the benches may be the crane operator or a friend they may have NOT paid the 350 per hour to remove the benches…. the operator may have felt he was in the right or who knows it will get messy now, i bet the guy pleads ignorance !! or is it ignorant ? I really doubt the person responsible having the benches removed thought he/she was in the right (legally speaking), otherwise that person would have shown their face and admitted to it. Still, the million dollar question now is who? dude when the camera is rolling try and speak semi intelligent….you jac a lope…. Hey TOL…what did he say about who hired him to do it?? Who was it?? You saw the newscast, but you didn’t tell us anything other than the crane guy not being the sharpest tool in the shed! Just clarificiation…OB Rat ….If you are commenting on my comment, I never said dogs “crapping” was justification for the unauthorized removal. In all of posts on the RAG I have condemned the removal of the benches. I also condemn the people that allow their dogs to crap in this area. If these people cannot be responsible enough to pick up their dog crap then they should loose the privilege of bringing their dogs to this area. This is great news. . .It just goes to show you what can be done when people are determined to get involved. . . I hope that the benches will be replaced in their chosen spot and that the perpetrators experience the full extent of their karmic actions. I saw this on the late TV news last night. The thief is really dense. I wonder who the person is who he claimed hired him but wouldn’t divulge.